Extrusion can be divided into two categories; forward extrusion and back extrusion. Forward extrusion is when the test sample is placed into a confined container and then forced through an orifice or grid. Back extrusion is typically performed with the product being measured is placed in an open top cylinder and a piston with a smaller diameter, is forced down into the sample, such that it flows back upwards, though the space between the piston and the cylinder. In both extrusion test methods, the resistance to flow is being measured, valuable in the study of the rheology of the product. Extrusion is also used to measure the spreadability of a product, where the piston and cylinder is replaced by a conical probe and a receptacle of matching geometry. The surface is initially penetrated before extrusion forces the product back around the probe to allow measurement of the resistance to spreading. 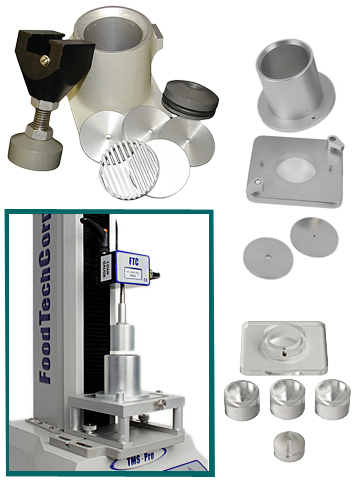 FTC extrusion fixtures and accessories enable the rheological property testing of semi-solid and viscous liquids by all of these methodologies and their impact on acceptable texture measured. Some of the texture attributes measured by extrusion may also be analyzed by testing the product in its own container - more closely representing the interaction with the conumer, or free standing – with the use of shaped probes, for example a cone-shaped probe.